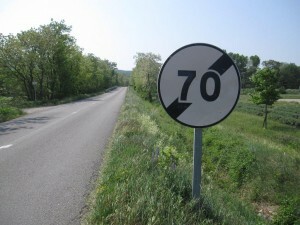 This sign tells you that the maximum driving speed is no longer 70 km/h. That speed zone is over. Maybe it’s just me, but I would find it more helpful if the sign mentioned what the new speed is. UPDATE: So apparently it is just me. All the other people who live in France (and apparently in many other countries) find it completely normal that you just KNOW what the speed limit is for that kind of road. Any sign that is posted is indicating an exception. This sign is merely saying “the exception is over, go back to your normal speed”. Maybe if we stay here longer I’ll be able to look at a road and instinctively know if it’s a 90 or a 50. Until then, I stick by my original premise that if you’re putting up a sign anyway, you might as well put one up that is informative for everybody, not just those who are in-the- know. We have a sign in our town that says “End speed zone.” But there’s no sign at either end of what the speed is/was supposed to be. It’s sort of a try-yer-luck stretch of road that I always suspect has an unmarked car with a radar gun poised along it. I suppose it’s just habit. In both countries I’ve lived in (the UK and France) it’s just been a given that you learn what the speed limits are on different types of road (in fact it’s part of the driving test). When driving in other countries, I’ve checked the atlas, guide books etc. for that info. I feel it’s one of the responsibilities that go with driving a car. It does help that road signage is fairly standard across Europe, with only a few local variations. So once you’ve learned in the UK, much of that knowledge (including the sign above!) applies in other European countries. Yep, you’re supposed to know! 50 in town (between the town sign and crossed out town sign). 90 outside town (80 when raining). 130 (110 rain) on the autoroutes. Hi Ryan. You just now made the connection for me between the crossed out town signs and the speed zone. I’ve always wondered why they did that. thanks!